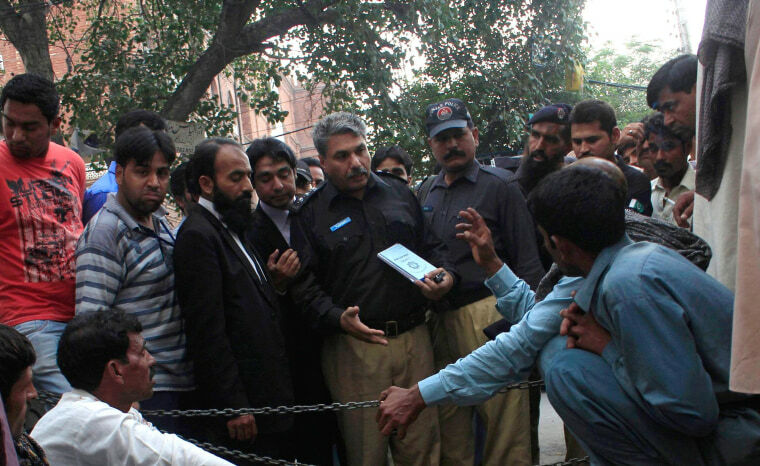 LAHORE Pakistan — The family of a pregnant Pakistani woman who was bludgeoned to death in broad daylight this week accused her husband of killing her, in stark contrast to his version of a story that has shocked people around the world. Police and witnesses said Farzana Iqbal, 25, was murdered by assailants including her own father outside a court building on Tuesday because she had married a man of her own choosing, Muhammed Iqbal, instead of a cousin they had selected for her. But on Saturday, Farzana's elder sister said it was Iqbal who had killed her. “Muhammed Iqbal and his accomplices killed Farzana, and her father and the rest of her family were wrongly accused of murder,” Khalida Bibi told reporters in the city of Lahore. Iqbal says they married for love in January. On Friday, he told Reuters that he and his wife were attacked by her family outside the High Court in Lahore, Pakistan's cultural capital. In a dark twist, Iqbal has also admitted that he had killed his first wife in a dispute over Farzana in 2009. Police have arrested five people in the death of Farzana, including her father.